Did you ever wanted to edit Flash Files with a few clicks easy and powerful? Modified, edit SWF Games, Logos, Banners, embedded Website Player Interfaces or any animated SWF Objects is with SourceTec SWF Decompiler possible. Change a logo or banner without having the project source code or recover losted source code. To make it even more easy there comes a Web browser extension with the Software. Sothink Catcher detect and download any Flash files from webpages. Sometimes you want to export/extract from a program exe file the included animation. Sothink EXE in SWF Extractor is made for this and shows you all detail info about the swf file. First of all, a shape editor – WYSIWYG was added in shape panel to modify the existing shapes. You can edit shape elements in WYSIWYG Shape Editor directly instead of opening the third party tool like Adobe Flash. It provides various ways to edit shape element in preview window, such as delete, copy, paste, select, transform, group and etc. You can set single color, gradient color or bitmap fill color for the enclosed area of the border line of the selected shape. Secondly, SWF Decompiler 7.0 enhances SWF to HTML5 converting function. Web animation could be developed by HTML5 without any extra plug-in; SWF Decompiler 7.0 is able to convert whole SWF to HTML5. Thirdly, the new version supports Flash CS5. It provides full compatibility of Flash from CS3 to CS5. Finally, it upgrades Flash Downloader for Firefox which supports Firefox 8.0. it helps you to capture and save Flash SWF from the latest version of Firefox. SWF Decompiler 7.0 is available to download now. You are welcome to have a 30-day free trial run. More information about SWF Decompiler 7.0. In this sample changing a Logo in SWF Animation. Watch VideoClip on YouTube. The user program interface can be switched from English to German, French, Italian, Taiwan and Korean. No matter if you are new into Shockwave Flash or a professional user, Sothink SWF Decompiler can help you in many ways and save you a lot of time. 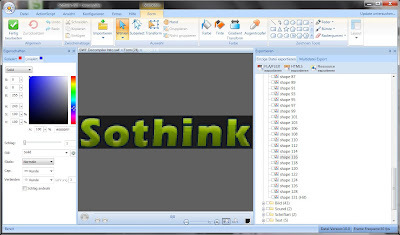 It's a very feature rich software program and offer a great editor mode.